I highly recommend that everyone look at their financial and career situations and come up with a Job Loss Emergency Plan just in case it hits you and your family. I had the fortune of checking out his book this weekend and I wanted to highlight some ways it can help you make the most of your severance. First, though, let’s start with some basic information about it. What’s Inside Engineer Your Layoff? While the language and subject matter is accessible to most people, I will say upfront that this is an information dense book. Don’t let the online format fool you. This is a real guide, chock full of details on how to craft and negotiate a severance that will make both parties happy. One thing I appreciated is that Sam shares some exercises to help you create a plan on for your end game. Do you want to switch your career or do you want to start your own business? Perhaps you’re looking at shaving a few years on your retirement. Too many people just want to take the money and run, but having a successful strategy means knowing what are your priorities are for negotiating. You also need to know which players to work with in your company so you can maximize your lay off. You don’t want to burn bridges – getting a severance package is a bit of an art and Sam shows you how. He also goes into the issues of collecting unemployment and taking a severance package, something that many people may skip over until the money runs out and they are scrambling to get everything together. Who Could Use Tips on Engineering Their Layoff? I will be the first to say that this book not for everyone. Sam gets into details and scripts on what you need to do months and weeks leading up to the severance package. This is for someone ready to make a life change and they want a financial cushion handy. This book is for those looking at putting in some work now to get the results they want. Someone who is looking to change careers or who wants to start a business could find this guide invaluable. For those hard working employees who are a bit burnt out and whose companies are not looking to great financially could make this transition mutually beneficial. 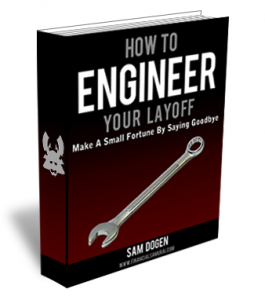 If you’re tired of your job and you’d negotiate a severance package that will ease the transition, please check out his book on How To Engineer Your Layoff. I’d love to hear from you. How many of you had to deal with a job loss?